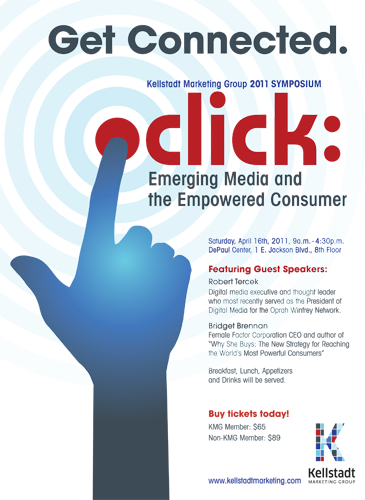 The Kellstadt Marketing Group (KMG) is hosting its award winning third annual marketing symposium on Saturday, April 16th, 2011 from 9a.m. to 4:30p.m. entitled "Click: Emerging Media and the Empowered Consumer" at the DePaul Center, 1 E. Jackson Blvd. Click will feature digital media executive and thought leader Robert Tercek, who most recently served as the President of Digital Media for the Oprah Winfrey network and "Why She Buys: The New Strategy Reaching the World's Most Powerful Consumers" author Bridget Brennan, who also serves as CEO of Female Factor Corporation. In addition to these two headliners, KMG is showcasing a variety of cutting edge marketing talent from Chicago area businesses including Arc Worldwide, Mobile Anthem, All State, Signal, Leo Burnett and more. Bridget Brennan will hold a book signing immediately following her closing keynote speech at 4:30p.m. KMG's 2011 symposium will bring together DePaul students, alumni and Chicago area marketing professionals for a day long exploration of cutting edge marketing content. It is Click's mission to examine the marketing implications of emerging media’s influence on today’s consumer. Click seeks to provide insight into the empowered consumer while shedding light on the opportunities and challenges presented by emerging media. Topics examined include Interactive Marketing, Mobile Marketing and Brand. Tickets are $65 for KMG members and $89 for Non-KMG members. Breakfast, lunch, appetizers and drinks will be provided. The event is open to the public. Additional information and updates can be found on our Symposium event page. The Kellstadt Marketing Group (KMG) is a community of DePaul University graduate students, faculty and alumni who are interested and involved in the practice and learning of marketing. KMG is focused on providing our members with the resources, knowledge and connections to become successful marketing professionals. In addition to providing a hub for professional networking, KMG also provides educational programs that enrich the graduate and experienced professionals’ careers. KMG is committed to upholding and promoting the highest professional standards in our industry.